The pier is 2,448 long which is close to half a mile. It is one of the longest piers in the Gulf of Mexico and it is twenty feet wide. Fishing from the pier is fun but can be a little difficult for a first timer giving the distance from the water to the pier (about 20 feet). There are usually local fishermen that are glad to help. Anyone who fishes from the pier usually stays at least an hour, though sightseers may not stay as long. However, there are no time constraints. Once you pay to fish on the pier you can stay as long as you like. Fishing is best in the spring and summer. The humidity can make it a little uncomfortable in the summer but that is easily rectified with a quick dip in the ocean. Daily fishing fees are $9 for adults and $5 for children but children 11 and under fish for free with paying adult. You must have a fishing license. A pier license is $11 and will allow you to fish from any pier in Alabama. A 7 day saltwater license is $30. If you only want to observe or sight see from the pier then the fee is $3 for a one time trip, or $4 for all day access. Looking over the rail of the pier and bringing up a Redfish or a Gulf Flounder from the clear sparkling water below is an adrenaline rush that creates unforgettable memories. 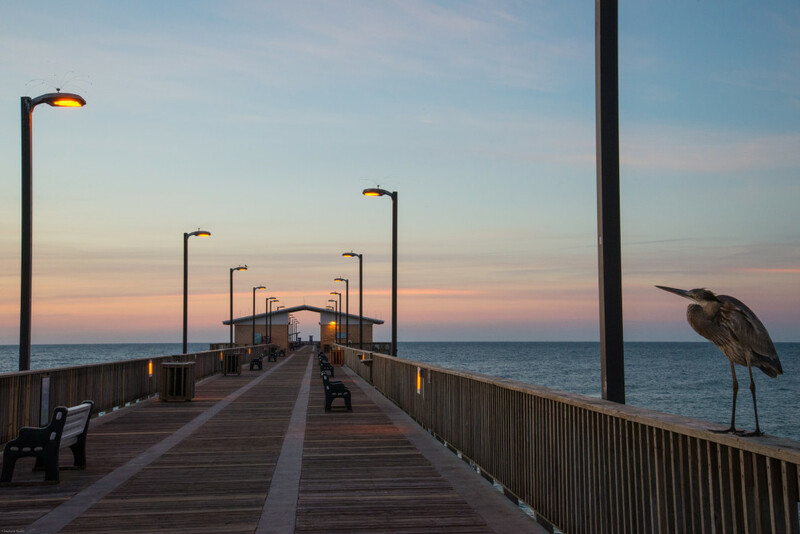 The Gulf State Park Pier in Gulf Shores, Alabama offers 2,448 feet of pristine fishing and sightseeing space on the twenty-foot-wide deck that jets out into the Gulf like a spear. It is one of the longest piers in the Gulf of Mexico, offering guests some of the most bountiful fishing and incredible amenities for fishermen and observers alike. Fishing from the Gulf State Park Pier is all about the experience of aquatic discovery, the thrill of the catch, and sometimes a surprise for dinner. It offers a sensational fishing experience where your ocean dreams may be interrupted by the opportunity to pull up the likes of a king mackerel or a snapper. Many local fishermen bring their own rods and tackle, but gear is available for rent from the indoor retail area to those who are just visiting. The indoor retail area boasts concessions, souvenirs, a tackle shop, and an indoor seating area for those who are observing or just need a break from the sun. 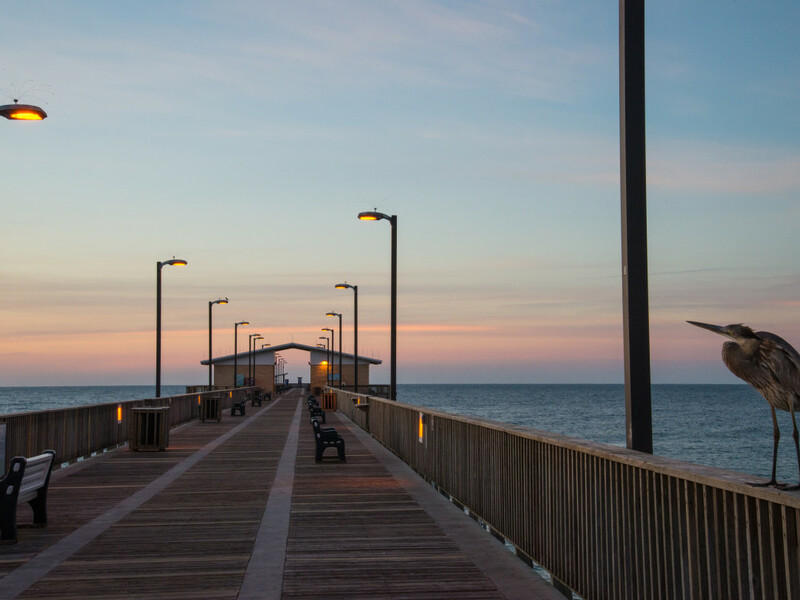 The long span of the Gulf State Park Pier is also equipped with comfort stations and rest rooms near the midpoint and wheelchair accessible rail fishing so that everyone can join in the fun. Many people bring their own chairs down to the pier and set up shop. Children love the spectacle of the fishing experience and exploring the long pier high over the water. Birds often land and even strut up and down the middle of the pier hoping to find a piece forgotten bait or leftovers from the cleaning station. Aspiring anglers looking for an opportunity to test their skills love the challenge of the pier. They spend hours casting their rods and leaning over the rail waiting to pull in the big one. Families enjoy bringing chairs and towels for a relaxing reprieve while the kids delight in the thrill of the pier and the crashing waves way down below. Photographers venture out to the end of the pier to get that incredible shot of the sun setting over the horizon with the native birds in the distance. This is also a must see for Gulf Shores travelers looking to spy the most gorgeous ocean views around. One thing every pier visitor should know is that you must have a saltwater fishing license to fish from the pier. A one-day pier license is around $11 and allows you to fish from any Alabama pier for the day. You can also purchase a seven-day saltwater license for around $30. Children eleven and under can fish for free with a paying adult. The Gulf State Park Pier, itself, is located at 20800 E. Beach Blvd and parking is free, but it will cost you to get onto the pier. You can enjoy the shaded picnic tables, snack bar, and public restrooms without paying the entry fee.